People, it’s time to draw a line in the sand. We know Aussies love the GC, with its golden beaches, churning surf, and questionably over-applied fake tan. But behind the Meter Maids and twisty-turny rollercoasters, there lurks a secret. Ready for the Underbelly-style reveal? We’ve gone undercover. We’ve worked late nights. We’ve pulled off the sting of the century. Here it is: Surfers Paradise, home to schoolies, surfing, and sun-tanned bods, is a secret haven of all things food. Surf’s up. Irasshaimase! Hey, QT (insert winky face here). Decked out like downtown Tokyo, we’d like to give a quick shout-out to whoever set this Japanese gem inside a hotel. No more post-gyoza gawking at the cab rank, no more sushi-induced sleeping on the train – just no fuss feasting with your room just steps away. Hey, even if you’re not staying, it’s worth a trip for a glimpse of Yamagen’s whisky-and-sashimi combo. Cravings picking up steam? Look no further than this trendy 300-seater spot. The sci-fi inspired fit-out brings ‘steampunk’ to the table – a combo of steam-powered machinery, copper trinkets, and dark-stained wood. Take to a leather booth for sliders, wood-fired pizzas, and cocktails like ‘The Shady Baron,’ all prepared on dry ice. We know you’ve bun hearing ‘bout this institution. With locations springing up at the toss of a patty, you can bet your Betty these toasty milk buns are worth a look-in. Explore everything from classic Angus beef, to crispy fried chicken, to the hero of the vege world: a crumbed mushroom burg filled with melted Gouda and Gruyere. Sure, it’s called Sandbar, but think fewer pelicans, more poké bowls. The Surfers icon stands for the sun-scorched, laid-back ways of the coast, dishing out cheeky menu names like they’re grains of sand. 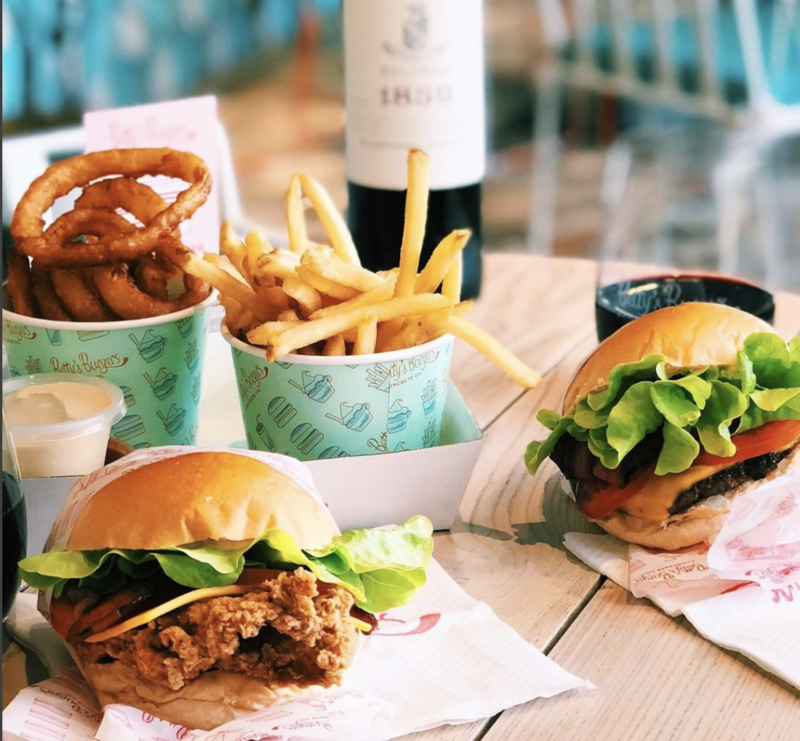 Lay into the Royale Wit Cheese, dig into a Hawaiian poké bowl, or cling to the classics with their ‘proper fish ‘n’ chips,’ a beachside feast if we ever saw one. We’ll admit, there’s not much linking the streets of Brooklyn to the boardies-and-thongs crowd in Surfers – but we guarantee you’ll fuhgeddaboutit at Brooklyn Depot. After first popping up in Brissie, the Beach Road spot doles out super-sized serves of chicken ‘n’ waffles, frickles, and brisket burgers. Hey, we’re walkin’, here! Honey, we’re home! Find brew love at this shrine to brews, BBQ, and cool-as-can-be cocktails. Settle in for a venture through 32 beer taps and a menu heavy in parmies, wings, and the coup de gras – cocktails mixed in lightbulbs, dry ice-topped chemistry beakers, and the Platform 9 & ¾ drink, which isserved on a tiny Hogwarts platform complete with Golden Snitch and trolley. GOALS. In case the name didn’t give it away (#symbolism), you’ll find this spot right on the water’s edge. Make some waves with a glass of bubbles before the real views arrive on the scene. We’re talking crispy skin pork belly, tempura crab burgers, and grilled half bugs topped in brandy butter. Water you waiting for? To market, to market! We’ve seen it at Garden City, we’ve seen it at Mount Ommaney – and now, the famed 8 Street is on its way to Surfers Paradise. Stay tuned for wok-tossed goods, curries to crave for days, and stir-fries that’ll make Singapore jealous. Like Harry Potter, this hole-in-the-wall spent most of its life tucked under some stairs. Fall under the spell at Stairwell Coffee, a hideaway treasure trove of nitro coffee, espresso, and cold brew. We’re starting to understand why crews were holed up in Fort Knox. Three words: All. Day. Breakfast. Swing by for Eggs Benny, swing by five spice calamari and pulled pork sliders – hell, swing by for it all! With modern eats day or night, you’ll never be left hangry. Knox on wood. Stop surfing the net; start surfing these flavours. - the gourmand who will always head south for the winter. Or summer. Or pretty much any time.